The city of Newberg is looking to make progress on a pavement preservation plan and will enter into an agreement for design survey, engineering design, bid and construction services to the tune of $131,855. The city identified several streets requiring pavement preservation as part of its five-year plan. For 2019, several street projects were recommended. 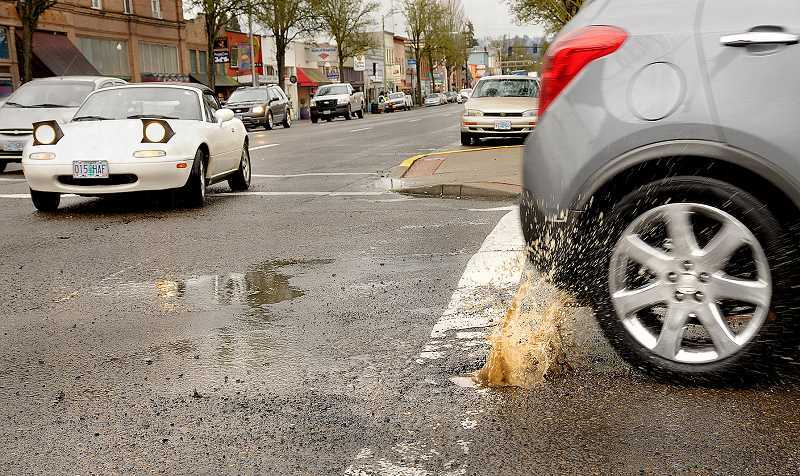 According to a City Council resolution for the partnership with Kittelson & Associates, Inc., these projects will be for improvements to roadway drainage systems for the identified streets and require surveying and engineering design. The city put out a request for proposals last fall and received one qualified offer from Kittleson & Associates. In September 2017, the council listed repairing and maintaining the city's streets and sidewalks, as well as securing funding, as one of their priorities. To do this, the city's public works department identified selected streets for restoration and preservation from 2018 to 2022. "The approval of this engineering design phase contract for the proposed 2019 project will allow for the development of construction plans and specifications for the proposed project for construction bid pricing in May 2019," the resolution states. "The project is part of the city's continuous effort to effectively preserve and maintain pavement for the city-owned roadway system, to increase mobility, comfort, safety and livability for everyone that works, lives and visits the city." The recommended streets for preservation in 2019 are: Fifth Street from Meridian to River street; Sixth Street from River to Columbia street; Brutscher Street from Hayes Street to Portland Road; Foothills Drive from North College Street to Aldersgate Drive; Second Street from Parkview Drive to Everest Road; Third Street from Church Street to Everest Road; Church Street from First to Third Street; Meridian Street from Pinehurst to Crestview Drive; and Fifth Street from Dayton Avenue to Blaine Street. Additional recommended streets included: Third Street from Highway 99W to Grant Street as well as Third Street to from College to Chehalem Street; Fourth Street from College to River Street; Hancock Street from Sitka Street to Elliott Road; Sitka Street from Highway 219 to Hancock Street; and Center Street from Henry Road to Edgewood Drive. Kittelson & Associates submitted a proposal for a scope of work which included verifying the types of treatment needed for preserving streets; assessment of sidewalk ramps for compliance with the Americans with Disabilities Act and upgrade them; topographic survey for developing design plans; preparing design plans, specifications and estimate for the bid process; and construction phase services. Crack and slurry seal projects will be designed separately, as they are not part of this project. The available budget for design in this fiscal year was $139,000. The project will span several years, with the engineering phase starting in the 2018-2019 fiscal year and construction starting in the 2019-2020 fiscal year. According to the resolution, "The 2019 pavement preservation project is approved for capital improvement expenditures in the 2018-2019 fiscal year budget and the construction will be included in the proposed expenditures in the fiscal year 2019-20 budget."